Branson, Missouri is a popular tourist destination. It seems to have blown up over the last few years. You could easily drop hundreds or thousands of dollars for a trip here. 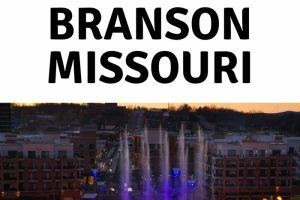 Instead of pumping out hundreds of dollars to pay for things to do, take advantage of all the free things to do in Branson MO. Visit over 500 miles of shoreline with Table Rock Lake. You’ll be able to spend quality family time here without a problem and for free! While on the shores of the lake take in Moonshine Beach, just because you aren’t near a coastline doesn’t mean you can’t have beach time! While at Table Rock Lake make sure you take in Table Rock Lake Dam. It was built in 1958 and is a sight to be seen! Located below the Table Rock Lake Dam is the Shepherd of the Hills Fish Hatchery where you can take in the beautiful aquariums and learn about fish in the area. Table Rock State Park in whole is just a great way to spend a day when the weather is beautiful out! If you like hiking make sure you take in the Table Rock Lakeshore Trail, it is a 2.2-mile trail you can pick up this trail at the Dewey Short Visitor Center. Another great hiking trail is the Chinquapin Trail at State Park Marina. While the North Beach Walking Path is great any time this is the best spot to watch the July 4th fireworks as well! The 2.7 mile White River Valley Trail System is great for hiking and biking! Dewey Short Visitor Center is the perfect place to make a stop and check out what’s going on in Branson. Plus, it’s free, which makes it even better! Take a walk at the College of the Ozarks and enjoy the natural and man-made beauty. It’s free to walk around and enjoy. While on the college campus make sure to take in Edwards Mill and it’s 12-foot water wheel. Scenic overlook at sunrise in Branson, Missouri showing the water reservoir from the Table Rock Lake Dam and colorful fall foliage. You will find Henning State Forest in the White River Hills. It is 1,534 acres if beauty that stretches for miles. Shrine of the Holy Spirit is a unique free place to check out in Branson, Missouri. The whole family will enjoy the tour. 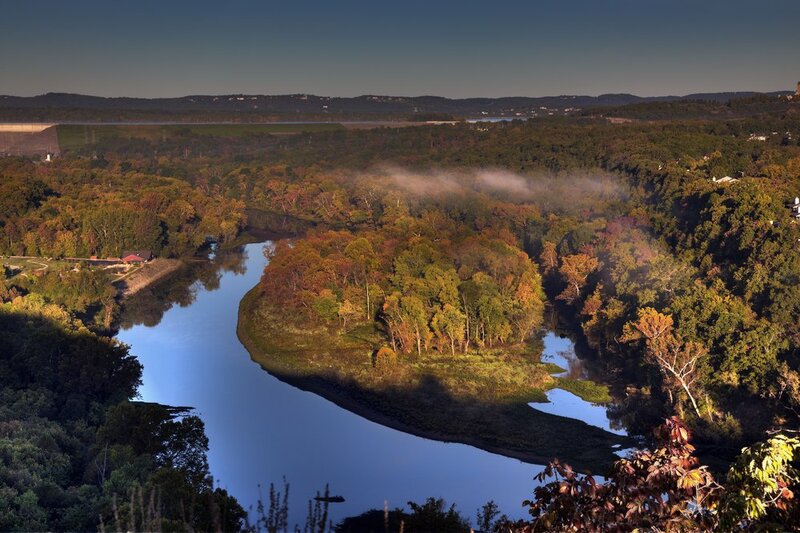 Roaring River State Park is just outside Branson with so much to do! Including caves to explore! Many parks have Junior Ranger programs you can take part in too! A trail that runs around a natural creek in Branson, Missouri is known as Waterfall Trail. It’s a newer trail in the city of Branson, but worth every step. Located right in the heart of Branson is Lakeside Wilderness Area. This area has trails galore! You can spend the whole day with the family enjoying Mother Nature and the unique beauty this place has to offer. The Branson Trolley can be taken for free and it’s totally worth doing so! Exploring Branson for free is something worth checking out. 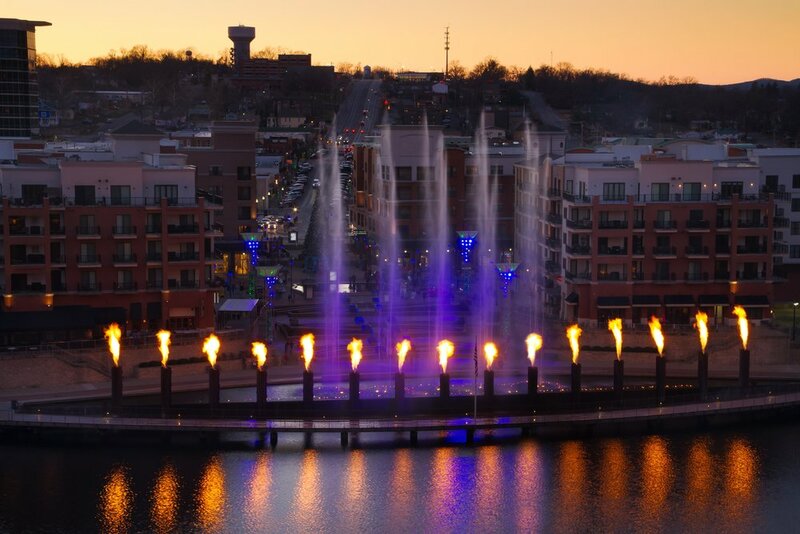 Make sure you check out Branson Landing, it’s a beautiful boardwalk with views of Lake Taneycomo and they put on a huge light show at night. Skyline view of Branson, Missouri with the display showing at the landing waterfront park area. The fountain has fire reflection into the water with tourist watching as they shop. 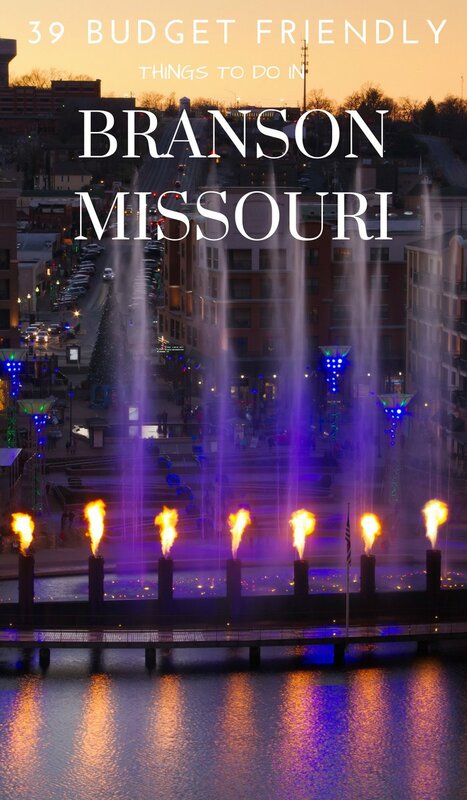 While at Branson Landing make sure you check out The Fountains at Branson Landing. Think the Bellagio fountain in Las Vegas on a slightly smaller scale. Speaking of Lake Taneycomo this is a great place for those who love to fish! Sunset Park is another free park to check out and take advantage of! It’s 21 acres and has a walking trail as well as a disc golf course. Make sure to stop at the Veterans Memorial Garden and take in all the beautiful art! After your trip to the Veterans Memorial Garden make sure to stop by the Avenue of Freedom which has over 100+ American flags flying. It’s great for pictures. Take a free winemaking tour at Curling Vine Winery, this is a family-friendly tour as there is grape juice for kids. Tour the Lindwelel Wine Garden and winery and enjoy some amazing views. Like the wineries above Mount Pleasant Winery also offers free tours and tastings! Historic Downtown Branson is a place you should check out while in Branson. You don’t have to buy anything. Just walking around and taking in the history of Branson is quite amazing. If you are in town September then make sure you check out the Autumn Daze Arts & Crafts Festival. Make sure you take in President Reagan’s Big Head as well. No really! It’s a 10,000-pound sculpture of his head. It is one of two surviving sculptures from Presidents Park. Make sure to download the Roadside America App for all info! JFK’s Giant Head is the other surviving statute from Presidents Park and is located about 3 miles from Reagans mentioned above. The Giant Fiddle and Bango with neon strings are worth stopping to take in! Another great stop is to visit the Mount Rushmore but with celebrity heads! Take in the Y Bridge. This is a unique bridge at splits half way in to make a Y shape. Outside a local Italian Restaurant, there is a 40ft tall meatball and fork statute that makes for a great picture! Ironically outside a local steakhouse is the world’s largest rooster statue. It is made of fiberglass and stands 43 feet tall. Bonus: If you book a show make sure to take advantage of your freebies! Many times you can get tickets to other attractions, free mini golf, or free old time photos done. Checking out Branson, Missouri on a budget has never been easier. It’s nice that a big city like this would still offer several free family-friendly opportunities.